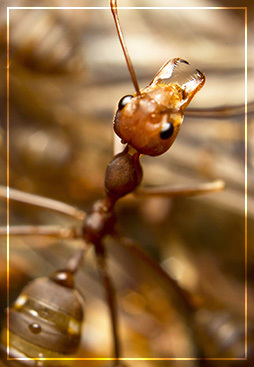 A single fire ant is about two to six millimeters long, roughly two-fifths the size of an aspirin. Doesn’t sound like something worth getting excited about, does it? Maybe not, but consider that the average fire ant colony has between 100,000 to 500,000 workers, teamed with several hundred flying ants and queens. Those numbers can change your perspective a little. The real problem is their bite. Many other insects can deliver a painful chomp, but fire ants really go the extra mile. They use their powerful mandibles to get a strong grip, then deliver a sting containing solenopsin, a toxic venom. Fire ant stings can be painful, particularly for pets and children. Adding insult to injury, fire ants thoroughly enjoy chewing through electrical wiring, and their presence can be highly destructive. To shut down fire ant colonies once and for all, contact the friendly professionals at Patriot Pest Management. We provide fully integrated pest management programs for clients throughout upstate South Carolina, and with more than 30 years of experience, we have the technology and methodology to treat your yard once and eliminate them for a year — guaranteed.